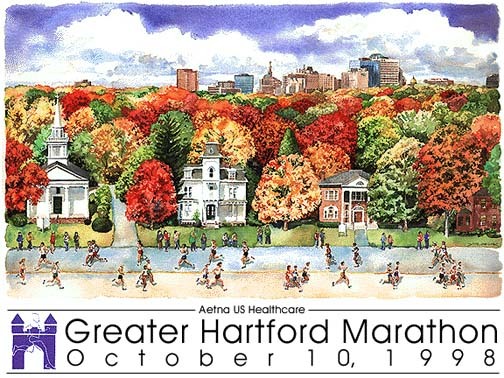 For the second consecutive year marathon artist Andrew Yelenak has designed and illustrated the Hartford Marathon's commemorative poster. "This year I wanted to represent the rural aspects of the race. You may start in the city, but you will pass through some beautiful country in South Windsor. I chose a birds-eye view from there, overlooking some of the town's historic buildings, but keeping the final goal in sight, the Hartford skyline." 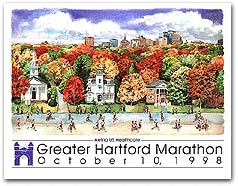 "The fall foliage is always a big part of the charm of this New England marathon, so naturally the autumn colors play a large role in my painting."